Yes, it's only November but Christmas will be here before you know it, so today we are sharing our Ultimate Christmas Gift Guide. Few items to get you through this holiday shopping season because we want to make your life easier. You'll thank us later. Fitbit - With Christmas comes New Years, and with that comes New Year Resolutions where most of us want to be a little more healthier, a little more fit so why not get a gift that will help encourage them reach that goal. It tracks our activities, sleep and the interactive app lets you track your food and water intake. We recommend Fitbit Iconic $299 or Fitbit Flex 2 $59. Watch - Watches are one of those gifts that are perfect for birthdays, graduations, and Christmas. A watch can be a timeless piece. We recommend Cluse La Bohème Mesh Rose Gold/White for her $114 and Jord Frankie Series for him $118. Monthly subscriptions - If you are looking for a gift that keeps on giving showing up each month after Christmas subscription boxes are perfect. You can try out new clothes, beauty products, wine or beer, and even books every month. Best part you can custom order them or let the recipient choose their selection. We recommend Muse Monthly a books subscription; Wine Collective for well, wine subscription; Craft Beer for a monthly beer delivery; Glossybox for a beauty subscription. Activities - A lot of the time, the best gift is a gift of time; time you get to spend with people in your life. Taking a class together, going snowboarding, going on vacations... you get the idea. These are some of the best gifts, and memories one can get. You can look up most of these in your local area but here are few suggestions to get you started. We recommend a cooking class at Sorrentinos; A Photography Class; Ski and Snowboarding passes; Pottery Classes or Paint Night; Yoga or Rock Climbing Classes; Photography Sessions; Hockey Game; Night at the Local Theater. DIY Gifts - Sometimes making a gift from the heart goes a long way. Home made gifts like a box of cookies or truffles, DIY projects like this Scent Diffuser or this Colorful Cactus Vases are what people remember and appreciate more. Personalized Gifts - One of a kind gifts are hard to come by now days, but personalization can make any gift unique. If you know someone who travels a lot, personalized travel tags are a perfect gift. We recommend Etsy personalized travel tags $20 and personalized camera leather strap $66+. 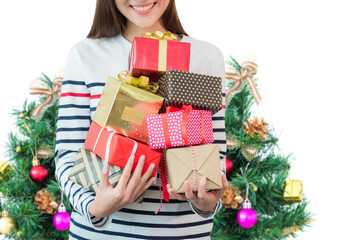 Gifts that give back - If you are a person who doesn't buy / exchange gifts there is always a need and opportunity to buy gift that gift back. There are lot of agencies that you can donate through, I have used Unicef survival gifts to make a difference in someone else's life. You can check out the list of items available for gifting via Unicef. Spa days, massage certificates, cleaning service, jewelry and gift certificates are always a good way to go if you are stuck and cant come up with anything. Making a donation in someone's name to a charity that is important to them is a great gift too. Few gift guides from previous years are available here. I would love to hear what you are getting your loved ones this year? Even more, what are you hoping to get this year?